Using colour is a brilliant way to add personality to your home, and prevent that bland, tired look that comes from a whole house painted shades of beige and magnolia. Not everyone is comfortable being bold with colour when decorating, scared of using the ‘wrong’ colour, or too much. Yet, there is no such thing as a wrong colour; if you like it you can find a way to use it. A gorgeous room will have a range of colours that fit together, and once you figure out what the lynchpin is that holds it all together, the room will look fantastic and will reflect your style and personality. More of a neutral person? It’s easy to assume that using colour means having to have jewel colours throughout your room and strong wall colours. But if that’s not your thing, that’s ok; there is nothing wrong with liking neutral colour schemes. There are a huge number of neutral tones available to use from shades of stone, a palette full of beige and soft creams, and they can work together brilliantly. When a neutral scheme has a family of neutral shades, from say café au lait to Jersey cream, complemented by texture and good lighting, it can be soothing and welcoming. Adding colour in the form of flowers or cushions can be an easy way to dip your toe in the water, while maintaining your soothing, relaxing space. Sometimes it is not the colour we are wary of, but the way in which we think about using it. It’s easy to think that to add a strong colour, we have to go for the tried and tested option of a feature wall. But the feature in you room could be a sofa, the view out the window, or even the art on the walls. If you pick a navy blue sofa, then combine with a warm pale grey on your walls, or a rich creamy parchment, the sofa becomes the feature. You can then pick up on the pale grey wall and combine it with navy and white patterned cushions to tie the two together. 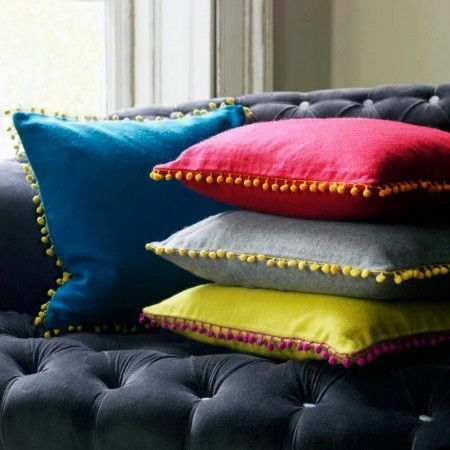 There is no need to go over the top with it either, a handful of colourful pieces that combine well can work better than having a full colour wall, which is one of the reasons I love cushion and throws so much – an easy (and commitment free) way to introduce colour. If you want to use more than one colour, then pick colours on opposite sides of the colour wheel, like orange and green, blue and yellow or various shades of the same colour. 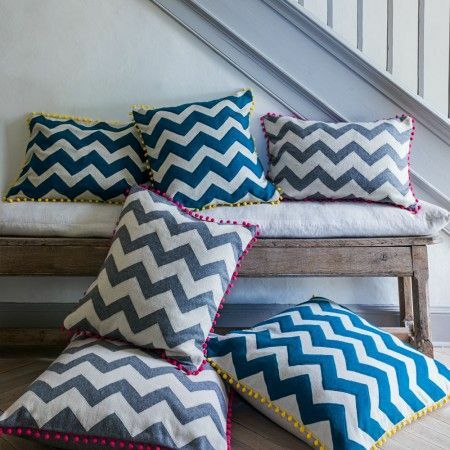 Sometimes it seems scary to use colourful patterns rather than just single colour fabrics on cushions and sofas. We’re all are open to wearing patterns on our clothes, or even to have patterned duvet covers and pillow cases in our bedroom, but in other rooms, some people are hesitant. Patterns are a brilliant way of adding a mixture of colour and texture to a room, without the fear of clashing. Select a striped cushion to rest on a solid colour sofa, or floral art work on a solid colour wall. 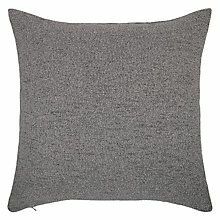 Then add a floral cushion on the sofa, using the same colour combination. Using a small patterned accessory in a room full of neutral and solid colours can add more depth to a room than a solid colour on its own, and it a gentle way to ease your way into pattern and colour. Geometric patterns, combined with warm grey walls and an inviting yellow armchair mean this once unloved sitting room is now a welcome retreat. With thanks to Dacre, Son & Hartley for permission to use this photo. Still a little scared by colour? Let AMC Design work with you to gently add colours in a way that allows you to get used to each additional layer of colour without being overcome!